In what could only be described as tragic irony, the owner of the company that manufactures the Segway personal transporter died after he fell off a cliff while riding one of his firm’s self-balancing motorized scooters. James William Heselden was reportedly riding a rugged off-road version of the Segway around his estate when he fell off a cliff and into the River Wharfe in West Yorkshire, England, the BBC reported. Heselden was declared dead at the scene after his body was retrieved from the river. The Segway scooter was also found in the water. 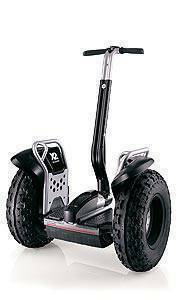 The Segway, an electric two-wheeled vehicle, was invented by Dean Kamen and was launched in December 2001. The personal transporter first became available to the public in November 2002. Heselden acquired Segway, Inc., in December 2009.